Olympus Mons is How Tall?! Olympus Mons is a big volcano. It is almost unimaginably huge. It is 550 kilometers (342 miles) across at its base, and the volcanic crater (the technical term is ‘caldera’) at the peak is 80 kilometers (53 miles) long. If you were standing at the edge of the caldera, the volcano is so broad and the slopes are so gradual that the base of the volcano would be beyond the horizon. That’s right, it is a volcano so big that it curves with the surface of the planet. And it is tall. 27 kilometers tall. That’s 16.7 miles from base to summit. 88,600 feet. That’s about three times as tall as Mt. Everest. Even Mauna Kea, Earth’s own giant shield volcano doesn’t come close. Measured from the sea floor to its summit, Mauna Kea is 33,476 feet (10.2 km) tall: taller than Everest, but only about 40% the height of Olympus Mons. The state of Hawaii, compared with Olympus Mons. Ok, so throwing those numbers around is fun if you like stats, but it still doesn’t convey quite how tall Olympus Mons is. So here’s an eye opener. Olympus Mons is so tall that it essentially sticks up out of Mars’s atmosphere. The atmosphere on Mars is thin to begin with, but at the summit of Olympus Mons, it is only 8% of the normal martian atmospheric pressure. That is equivalent to 0.047% of Earth’s pressure at sea level. It’s not quite sticking up into space, but it’s pretty darn close. In fact, it was first confirmed to be a huge mountain when Mariner 9 saw it towering above the top of a global dust storm like an island in a rust-colored sea. An airbrush painting of Olympus Mons towering above the clouds by Gorden Legg, a Hollywood artist, based on Viking Orbiter mosaic P17444. Finally, since it is fun to compare Olympus Mons to Mauna Kea, what would the pressure be like at the summit if we placed Olympus Mons next to Mauna Kea in the Pacific? In that case, the summit of Olympus would be 21 km (68,897 ft) above sea level: still higher than Everest, and about twice as high as normal jets fly. The atmospheric pressure at the summit would be about 4.6% that at sea level. For comparison, at the top of Everest it is about one third the pressure at sea level, and most people still need to use oxygen canisters. Olympus Mons is huge. Hopefully these numbers give you a little better idea of just how huge. If you’re wondering how it got to be so big, I already wrote about that in this post about shield volcanoes, so go check it out! The tallest mountains on Mars, Earth, and Venus compared. Note that the horizontal scale is drastically squashed. 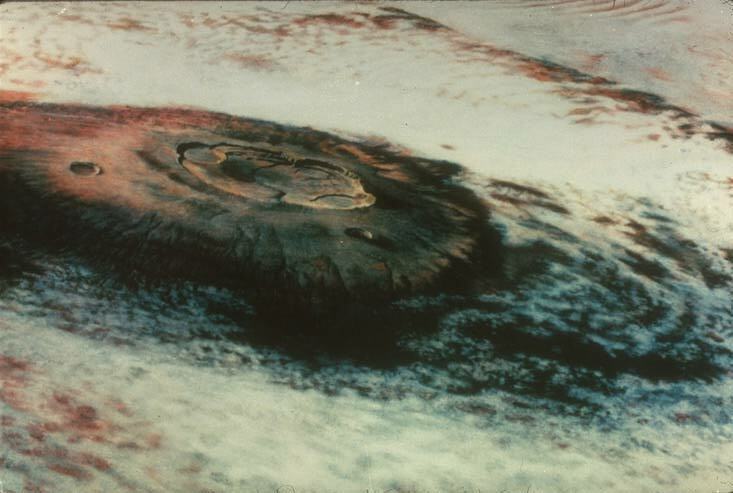 The above image allegedly from Mariner 9 would hard for the hardy little orbiter to generate, as the color filter wheels failed as the global dust storm was receding. I was intrigued, so I went a’googling for the source of this image, which comes up a lot. LPI has the answer – it was an airbrush painting by Gorden Legg, a Hollywood artist, based on Viking Orbiter mosaic P17444 link , commissioned for a NASA movie on Viking and found the cover of NASA Special Publication 444 “Images of Mars: the Viking Extended Mission”. An actual picture of Nix Olympus, as it was known, emerging from the murk can be found here. 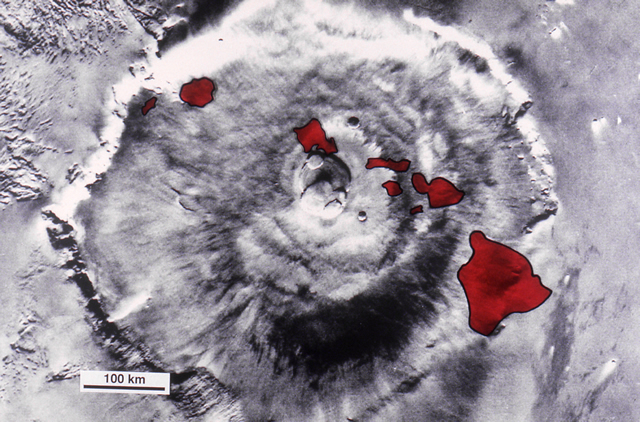 Another note: if you scale for gravity, Olympus Mons is about the same height as Hawaii. Both of course pale in comparison to the largest volcanic system in the solar system: Earth mid-oceanic ridges, which over the course of less than 100 million years generated at least 2/3’s of Earth’s crustal area, and wrap around the planet. Oops, I realized while I was writing that that image couldn’t be from Mariner 9, but apparently forgot to fix the caption. Thanks for digging up the info, I’ll fix it now! I’m currently reading Red Mars and I have a new/better appreciation for pretty much everything Martian. Vague spoiler follows: The party on Olympus Mons and the surrounding descriptions of the mountain are what I’m thinking of here. On a side note: Reading Red Mars and thinking about the base on Phobos made me realize how cool being in different gravity would be… Where are the moon hotels! I just started re-reading it. Is the map in your book backwards, because it is in mine! The words are correct, but the geography is flipped east-west. I remember being really confused by the map back when I first read it, and now I see why! Fantastic….and they say that their couldnt be life on other planets..
that is big montin there man you guy rock for finding it. Tingginya gunung ni.Ingatkan Everest yang paling tinggi wou……………………. So how high is this mountain when compared to a time a an average lift would take to go to the top ? A normal lift would take about 3 hours to reach the top. The fastest elevator in the world, at the Guangzhou CTF Financial Center would take about 22 minutes to reach the top. A normal lift would take about 3 hours to reach the top. The planned fastest elevator in the world, at the Guangzhou CTF Financial Center would take about 22 minutes to reach the top. What a piece of rock. I would love to see it at its peak eruption and I believe it is still alive according to scientists. It would make our “Super Valcanoes” on earth look like small firecrackers. The wonders of just our own star system is amazing. In the future solar systems that are beyong our dreams will be found and some will be teaming with life….it is just a matter of time. I believe for anyone to think we are the only intelligent beings in the entire universe has to be a total Moron. The ones who do believe of no life except earth simply have not learned even any of the basics of the universe. I cant wait when our technology reveals scientific hard evidence of an intelligent species on another planet somewhere….and no there will no mass riots planet wide….there may be a few scrums breakout, and thats it….. and I also feel religion wil actuallyl benefit……and NOT be hurt as many people predict. I do buy into the increasing thought of it IS NOT a good idea to try to make contact even if the then future tech allows us to do so.. To me, the risk outweighs the reward and if possible to discover the intentions of these beings asap, again if it would be possible to even do that. Sure, they could bring us out of this world positive tech ( no pun intended ) that could greatly benefit us all….yet behind “door #2” could bring about complete vaporization of earths complete civilization and then leave no traces of any prior existence whatsoever of the human race and its structures.Wiped clean-forever. Maybe, just maybe…. Our Moon would then be the only proof of our prior existence—Nasa & Russian equip purposely left on the Moon- items such as Moon exploratory equipment—- rovers, old space capsule launch pads, tools, flags, etc….. and WOW…..even old astronaunt’s actual pristine footprints, unfazed & untouched by father time. Think about the above….the only remnants of a once planetory wide of a bustling civilization and now…… zap…..erased forever.